ELOS: the ultimate supplements and equipments for marine and planted aquariums. Elos is an aquaristik company that is exclusively dedicated towards the development, production, and marketing of specialised, high quality products for the aquarium market. We apply the latest advances in marine and fresh water sciences into our manufacturing and products. We are environmentally responsible as well as respectful of the key ethic rules on employment and production. Almost all our products are made in Italy, through few, well trained Internal Employee with the help of key external suppliers, Universities and Research Centres. Our commitment is to invest in the future, we take great care of details and innovations but beside this we also take care of our traditions. We apply modern process, but we also use traditional techniques, employing local craftsmen for the production. We take great care in designing our products, and packs to simplify their use making them pleasant to see and to touch. From the first contact with our products you will immediately perceive the care to produce them and the great attention toward each single detail. For all this we invite you, by heart, to try our products. Join your passion with us, use our products and make the best out of them and, we are sure, You will experience the delight of creating your personal, unique underwater world in a beauty you have never seen before. 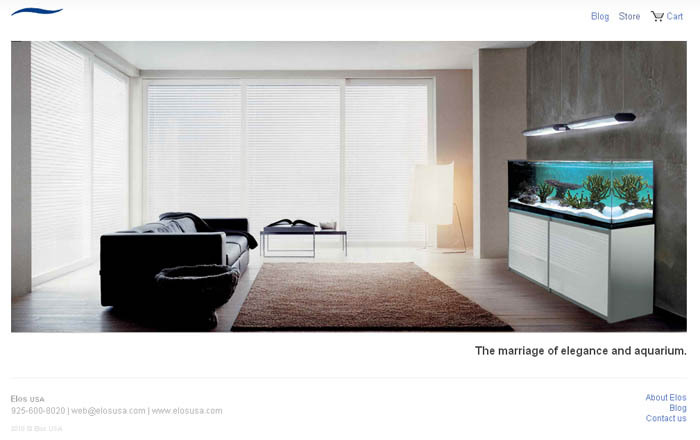 Elos USA has just launched a new website taglined The marriage of elegance and aquarium. The new website sports a clean and user-friendly design, which is a marked improvement over the old design. All of the buried pages, complex navigation, clutter and confusion have been replaced by a clean look which matches the Elos line of products. And as if that wasn’t enough, Elos USA has added an online store featuring their complete product catalog. 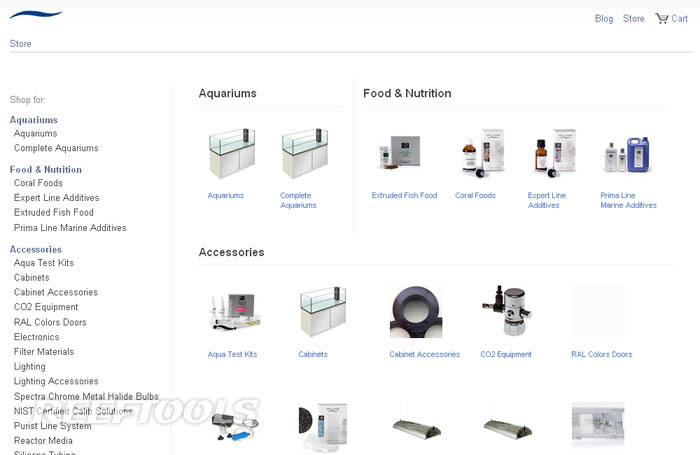 So whether you’re looking for an Elos rimless aquarium, aqua test kits, lighting, or any other Elos accessory, you can find information and pricing directly on their website. This will be very helpful for those of us who don’t live close to an Elos dealer. Another feature that we are happy to see is that contact and support information is now presented prominently. Way to go Elos USA.